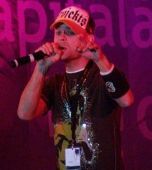 The Mirror reported that former East 17 singer Brian Harvey was offered a five-figure sum to appear in January's celebrity Big Brother. The paper said that he initially turned it down after being worried how he would come across but is now considering the offer again. "He has been offered Big Brother but initially he turned it down. "His friends thought he was being silly, he isn't exactly rich but he was refusing. "Now he is talks again, CBB are desperate to sign him but Brian is still thinking about it. "He wants to come across well and he isn't sure that he will. That's what is throwing up the doubts." He was in the news recently after turning up at Downing Street and demanding to meet with the Prime Minister. Here for Brian and Chloe J befriending eachother and destroying the rest of the house.